These calm and cold-hardy birds can be seen at Connecticut’s Beardsley Zoo’s New England Farmyard area. The Plymouth Rock Barred Rock is a Heritage Breed and although not a strong flier compared to most birds, is capable of limited flight (especially younger, lighter birds). DESCRIPTION: Plymouth Rock Barred Chickens have a bright red single comb, face, wattles and earlobes. The comb of this breed has five evenly serrated points. The points in the front and rear are shorter than those in the middle. Feathers that appear in sharply defined parallel lines of black and white cover them. The pattern is similar to one found in rocks, which is how they got their name. This is also why they are sometimes called “Barred Rock Chickens”. They have yellow legs and feet and four toes on each foot. Their beaks are also yellow at the tip. They have a long, broad back and a moderately deep, full breast. 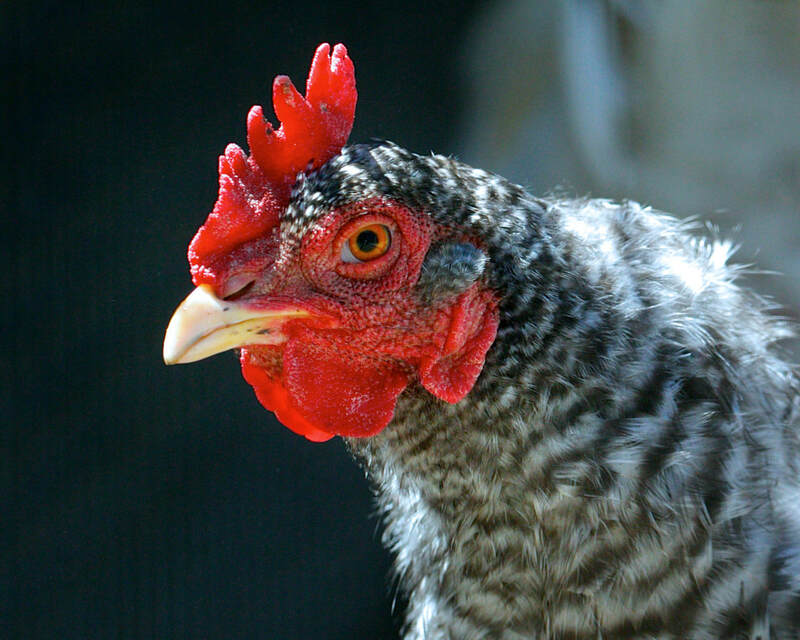 Females, called hens, can weigh up to 7 ½ pounds while the males, called roosters or cockerels, weigh up to 9 ½ pounds. They can be up to 34 inches long. Young females that are fully feathered but less than one year old are called pullets. Plymouth Rock Barred Chickens are known to be excellent foragers. 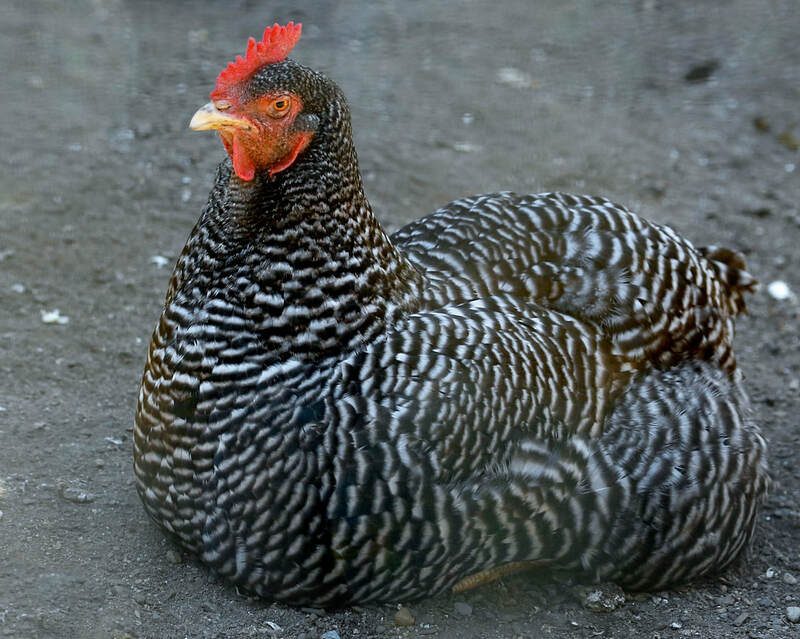 RANGE: The Plymouth Rock Barred Chicken is very hardy in cold climates so it is a favorite of northern farms but they are able to live in any climate. ​HABITAT: They are domestic creatures that live wherever humans live. They enjoy having a free-range lifestyle but also are very content being confined. DIET: Omnivore – seeds, insects, grubs, worms. They are also big drinkers and consume 2 to 3 times as much water as they do food. FAMILY LIFE: Chickens are social animals that live together in flocks. A family unit consists of one or more hens (female) with one rooster (male). Hatchlings are called chicks. The female will lay a medium to large, brown egg approximately once every 25 hours. Each female can lay between 200 and 280 eggs per year. Healthy females will lay eggs up to an average age of 8 years old. After incubating for 21 days, the newborn chicks emerge from their eggs covered in soft down. Over the five or six weeks they will follow the mother around learning how to forage as they shed their down and grow out their full feathers. LIFE SPAN: The average life span is 11 years. Connecticut's Beardsley Zoo is a 501(c)(3) not for profit owned and operated by the Connecticut Zoological Society.